While participating in a game, there is always a good amount of laughter. Laughing together and having fun can keep the seniors happy and healthy. While growing up we often forget that our parents too are growing old. Often the family members have different schedules which push us in different directions. But playing games (maybe a card game) even for a short while with your elderly loved ones is a perfect way to spend time together. We may not realize the importance but for them it’s quality time and a priceless gift. Board games or any indoor games help us to practice essential cognitive skills and enhance the parts of brain responsible for complex thought and memory formation. Creative indoor games help the brain retain and build cognitive associations well in old age. Keeping the mind of seniors’ active and engage means they are exercising the brain and building it stronger. A stronger brain has lower risks of losing its power and thus reduces the risk of cognitive decline, such as associated with dementia and Alzheimer’s. Laughter helps in producing endorphins (a chemical that gives the feeling of happiness) and that naturally help muscles to relax and blood to circulate which will evidently lower blood pressure. Positive feelings and thoughts, like the laughter and enjoyment that always comes with board games or card games, improve immunity by releasing some chemicals that fight stress and boost immune system. Many board games require the use of fine motor skills to pick up or move pieces, actions that take both coordination and dexterity. Regular practice and activity improve their basic skills which are important to elderly. 1) Card Games -Card Games such as bridge, rummy; pinochle etc. can stimulate the brain and help memory loss. 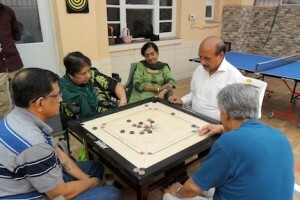 2) Board Games – Seniors can enjoy board games like scrabble, carom, Ludo, dominoes, world safari, monopoly, bingo etc. 3) Mahjong – This game involves tile matching. The players simply locate matching tiles and remove them in pairs until they can’t go further or they clear them all. 4) In my suitcase (memory game) – In this game, one person lists an object and the next person has to repeat the previous names and then add his or her own, and so on. 5) What’s That Saying – This game includes hundreds of well-known sayings. Players are given clue words to figure them out. Be the first to guess the correct saying! 7) Guess the song – One person plays songs, shares lyrics, or gives clues and the rest guess which song it is. 9) Crossword Puzzles and other interesting word games like Spellathon, make words, weave a story etc. There is no such thing as “age appropriate” when it comes to play. At every age play is not a luxury, it is a necessity! Great Times by Samvedna is our new social and recreational club in Sector 43, Gurgaon, for members 55 years and above. Its a place where members come to get fit, make new friends and share their life experiences and give back to the community. Activities at the club include fitness exercises, mind stimulation, tambola, dancing, book reviews, movies, community outreach, and talks on health management. The club has a library, computer room, visits by physiotherapists and doctors, access to board games and cards, a fully functional pantry with healthy and affordable snacks and tea and coffee on the house. Transportation is available on select routes. There are special discounts for group memberships. The club is open Monday-Friday, 11am to 4pm. There are special classes for yoga, computers, music and painting.